Hy-Tape Adhesive Patches have all the same great qualities as our traditional rolls, but are designed to cover a large area. Hy-Tape Adhesive Patches have all the same great qualities as our traditional rolls, but are designed to cover a large area. The patches are available in 4” squares and 5” squares and are perfect for making hydrocolloid dressings completely occlusive. Our goal was to save care givers time and money by not only reducing the need to change dressings, but to create a water proof barrier for cleanings. 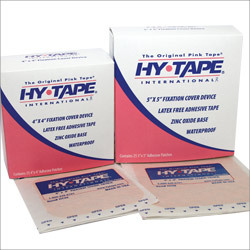 Because Hy-Tape conforms to body contours and can remain in place on oily or hairy skin, our HyTape Patches are a great solution for a multitude of applications.